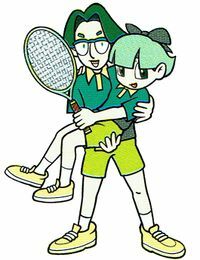 Sean is a character in the Game Boy Color version of Mario Tennis. He is an unlockable character, unlocked by defeating him in a double match of the Island Open. Like his partner Sammi, it appears that Sean like the color green, since both of them wear shirts and pants that are green. Sean is an "All around" player. This page was last edited on November 2, 2018, at 13:59.